Instead of going with a standard store-bought Valentine for your special someone, try making your own this year. A roll of duct tape can go a long way when it comes to crafts. Here are a few ideas. These little beauties have been around for many years now, and aren’t all that hard to make. 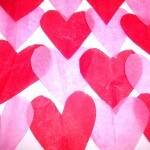 Here is a link to the Duck Tape® brand duct tape Rose Color Chart of Love. Looking to do some decorating for Valentine’s day? Valentine’s Day garland is a simple way to bring a little love into your living room. Here’s how you do it. Check out our wide selection of printed duct tapes here.